Rocket fire on Tel Aviv in mid-March was one of the tactics for disrupting Israel’s election campaign approved by Hizballah’s Hassan Nasrallah and Palestinian terrorist chiefs from the Gaza Strip when they met in Beirut on Wednesday, Jan. 30. This is disclosed by DEBKAfile. Ayman al-Shashniya and other heads of the Palestinian Resistance Committees (PRC) traveled to the Lebanese capital from the Gaza Strip for the meeting. It was prompted by a coordinated signal from Tehran and Beirut. On Saturday, Jan. 26, Nasrallah said in a speech that Prime Minister Binyamin Netanyahu would not be allowed to commit “big and foolish” actions under the pressure of his campaign for re-election. Three days later, Ali Shamkhani, head of Iran’s National Security Council, disclosed that precise rockets had passed into the hands of “the resistance” in Lebanon and Gaza, ready to respond to “foolish actions.” Shamkhani is one of the most competent and controlled officials of the Islamic regime. Placing him in charge of the “Gaza Dossier” indicates that Tehran and Hizballah are seriously plotting to intervene in the campaign for Israel’s April 9 election, specifically by igniting the Gaza front. Nasrallah praised the Palestinian terrorists at their meeting for their role in the regular, weekly Gaza border offensives on Israeli forces. He complimented them on the exploding Palestinian flag trick, which on Sept. 23, caused four Israelis soldiers to be injured when they tried to take it down. DEBKAfile’s military and counter-terror sources report that the PRC is a small terrorist group whose operations, finances and organization are controlled by Hamas. Hamas itself opted to stay in the background of the plot so as to keep the monthly cash payments from Qatar on tap through Israel and the UN. Therefore, the PRC was sent to Beirut to work on details of the Palestinian operation for sabotaging Israel’s election campaign in coordination with Hizballah and Tehran. According to our sources, they decided on a stage-by-stage strategy, scaling up the attacks from the Gaza Strip in the coming weeks up to a climax towards mid-March, three weeks before polling day. The meeting lined up Israeli targets for rocket attacks, including Tel Aviv. Great! This will only strengthen the right. They are also profoundly miscalculating that a rocket fire on Tel-Aviv won’t have a sever response. Wrong. Bibi will not lift a finger unless it srves the chair. His chair. Nothing else matters to him. that’s exactly the point, netanyahu has positioned himself as centre-right, and the best option for dealing with terrorism from strength. a renewed terrorist threat will boost his support, because people are not willing to change leadership in the middle of a crisis, and it will increase voter turnout. he will strike back, and the electorate will reward him with more seats. Actually you’re wrong, the only thing the government cares about is Tev Aviv. If it was one of the gaza border towns or even Haifa they wouldn’t care too much. Poor arabs, them and their desert culture only knows how to sow discord and destruction. In the end, it will only be their own people who will suffer. The heavens always harden the hearts of Israel’s enemies, right before they are destroyed. Perhaps Israel will be called upon to usher in the age of Neo-islam, by destroying their old structures allowing them to chart a new path forward that focuses on providing for their own people instead of trying to always take and disrupt their neighbours. For the antisemitic squatters, neo-Islam means fornicating with MBS! Europe’s welfare colony in the region can’t win a war against widows and kite flyers, yet defenders pretend that the LOSERS have some strength remaining! Remember what happens when the squatter colony takes on Hizbollah? They get their teeth kicked in, every time. Just ask the Golani Brigade. Ayman al-Shashniya= Haman of Shushan?! March 20 is Purim in Tel Aviv, is that when they want to fire missiles? היימן אל-שאשאנייה = המן משושן? Questions remain as to how to neutralize Iran, Hezbollah, Hamas and their funding. TOTAL SHOCK ‘N AWE WAR is one choice, that will no doubt result in international condemnations of Israel as they utilize disproportional responses, and with aid of the USA military. All three can be reduced to 15th century farmers, albeit with a combined millions of casualties and without the use of nuclear weapons. EMP preemptive attack or as retaliation against Israel and the USA will be useless and ineffective as per in-place software, hardware, and industrial physical grade counter measures. War is won by KILLING THE ENEMY, not negotiating with them. The USSR is no exception of the always failure of negotiations and economic implosion, with resultant Putin’s aggressive Russia now as proof. iran is calling the shots, and they’re prepared to fight to the very last lebanese. Not worth of too much consideration to discuss specifically Nasrallah, he dies in 2019. Every country is concerned about other countries that try to disrupt and manipulate their elections. Look at the US election regarding Russia. Israel should make sure every news media around the world is advised of this in advance, showing how gazans/palestinians are overtly planning to manipulate Israeli elections via Terror. They are not interested in peace. Won’t work. Over 80% of the media in the world is controlled by the globalist cabal that is proHitlery and anti-Israel. Israel is very very strong Militarily at the moment but very very STUPID Politically..
Hezbollah are much weaker now and very very Tired due to their Proxies in Syria and Iraq,Yeman and elsewhere. They have lost many many fighters and do not want a WAR with Israel just yet until they have regained their strength and recruited more willing fighters.The Israeli Elites in Government are Delusional and have NO Instincts to Defeat Hezbollah and WEAKNESS is your own Enemy and that is why mr Nasrallah is Laughing and still Intimidating Israel without even firing 1 Shot. it will be with overwhelming Force with of course the Backing of Poison Putins Special Forces in their special Camouflaged gear and giving Intelligence about Israeli Forces Movements that Hezbollah can then Target with Precision Weapons brought under cover with Poison Putin’s Full Knowledge. Don’t say you were caught off guard because you have seen the writing on the WAILING WALL but like FOOLS you think if you keep Quiet the Threats will go away…Oh NO Stop Banging your Hollow Heads on that Stupid Wailing Wall because you are Suffering with Concussion and are not thinking Clearly. Nasrallah and Half the World knows how its all gonna END and Russia,Germany,France and others will celebrate your own Demise….Facts not Delusional Israeli Fiction. 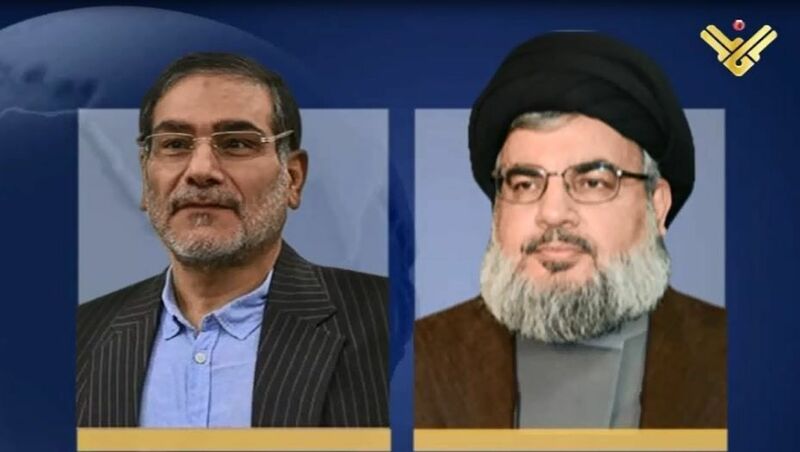 It’s time for Nasrallah to go meet his father & his Iranian generals follow soon thereafter. Snakes don’t die easily, but surely when their head is cut off. I like nasrallah when he has a weep !! to nice . so nasrallah , what are you waiting for to trough a missil ? I hope you are not fool !! What happens when sand fleas irritate the culture that made the Middle East bloom? Time for a little insecticide!